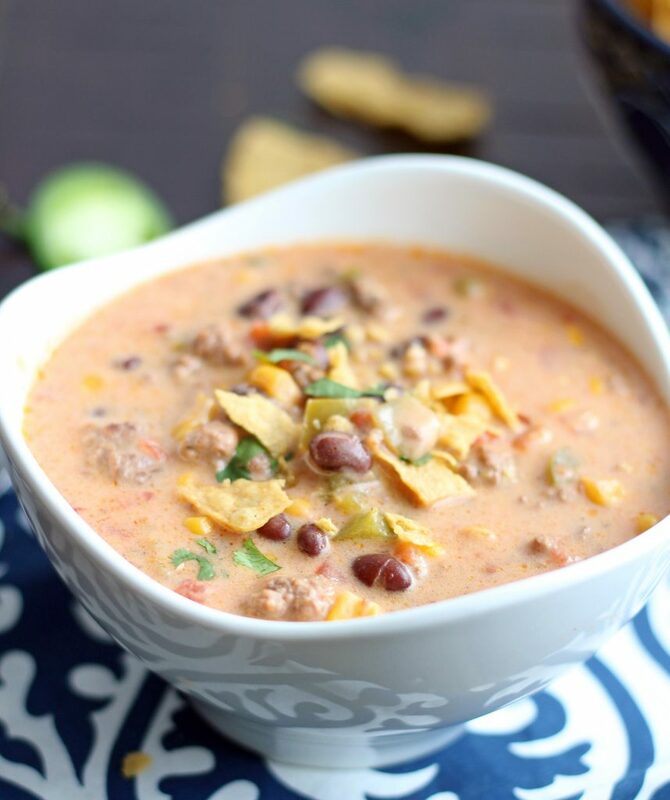 This Slow Cooker Beefy Nacho Soup has all of the deliciousness of cheesy nachos packed right into it! 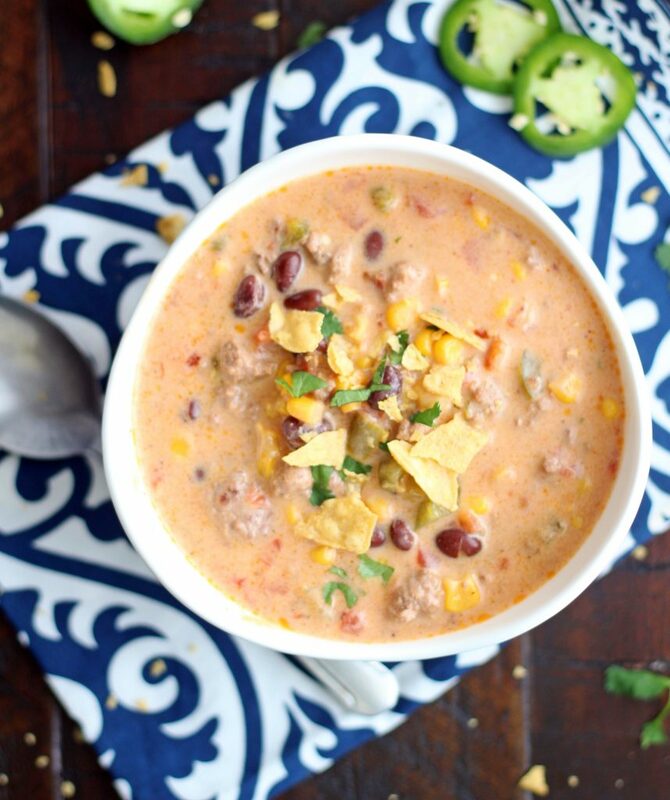 This soup is so simple to make and will become an instant favorite! 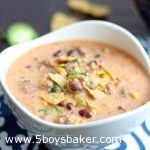 I had no intentions of posting this Slow Cooker Beefy Nacho Soup recipe today. In fact, I was actually going to save it for the fall, but those plans all went out the window yesterday thanks to Mother Nature. 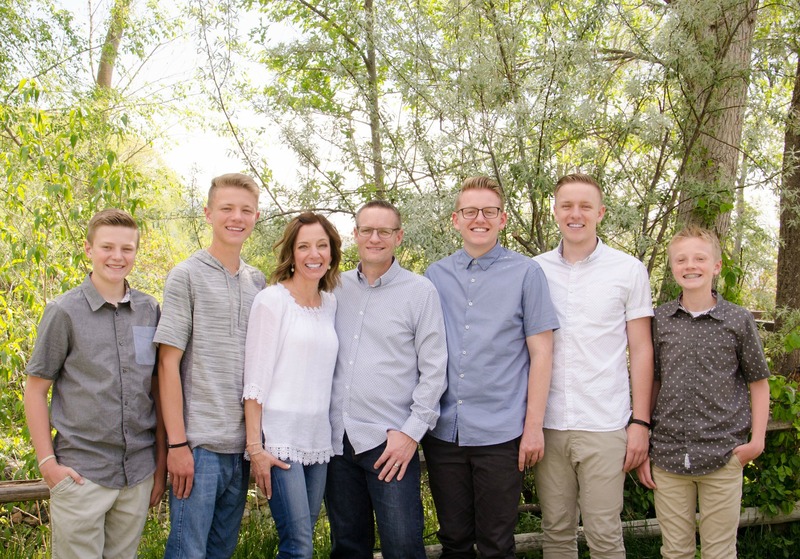 She’s totally messing with us here in Utah. I woke up yesterday morning to a snow-covered lawn and it just kept snowing for a good part of the day yesterday, I was freezing all day and all I wanted was soup. So I’m sorry if where you live it’s 90+ degrees and the last thing you want is soup. But look at it this way, if it’s that hot, the last thing you want to do is turn your oven on and heat up your house, right? If you use your slow cooker, you avoid that problem. So you should make this soup. I know having to brown meat before you add it to your slow cooker might annoy the crap out of you, so if it does I’m sorry. But I hope you don’t let that stop you from making this soup because it’s absolutely delicious. The ooohs and aaahs I heard coming from my boy’s mouths told me immediately how much they loved this soup. We loaded ours with crushed tortilla chips and even topped it with a little more grated cheese. You guys, it’s so, so good! You really need to make this. If you want this soup to have more kick, then add the seeds and membrane from the jalapeno and if that doesn’t give it enough kick for you, you can add a second jalapeno. If your kiddos are opposed to chunks of tomatoes, then you can put the tomatoes in a food processor before and give it a few pulses, or you can also take a pair of kitchen scissors and cut the tomatoes a little smaller while they’re still in the can (I’ve done it both ways). You can use any cheese you like, but my favorite combination is using both sharp cheddar with pepper jack. Because the meat is already cooked when you put it in the slow cooker, this soup really doesn’t need to cook super long. Four hours on low is plenty long, but if it ends up being longer because you’re at work or whatever, that’s fine too. On the flip side, if you’re in a hurry and need it done faster, you can cook it on high for a couple hours. In a medium sized skillet cook the ground beef, onion, and garlic until beef is no longer pink. Drain the grease and add to slow cooker. Add green bell pepper, jalapeño, corn, black beans, tomatoes, chili powder, salt, pepper, red pepper flakes, and chicken broth and stir to combine. Cover and cook on low for 4 hours. 30 minutes before it's done, add the shredded cheese and stir well. Whisk together the cornstarch and heavy cream until smooth. Pour into slow cooker and whisk in until combined. Continue cooking for 30 minutes. The fire roasted salsa style tomatoes that I use are the Great Value brand from Walmart. I've also seen the salsa style at Smith's (Kroger brand). IF YOU TRY THIS RECIPE, COMMENT BELOW! I WOULD LOVE TO HEAR WHAT YOU THINK. Hi Jodi. I need a new slow cooker and thought you posted a while back about your favorite brand. It had the pan you could brown in without washing another pot. Can you let me know what it is? Thanks. Hi Teresa! My slow cooker that I love is the Cuisinart 6 quart. I absolutely love it. Stuff doesn’t burn in it and you can brown/sautee and steam in it. I’ll attach the link on Amazon for it. Looks like today it’s $107 which is a really good price. I’ve seen it as high as $155 so you might want to snag it today. I have seen it drop to $99, but never below that. I know it’s pricier than most slow cookers but it is worth every single penny. Let me know if you end up getting it. Have a great day!